This feature helps the user import test suites from other pre-existing projects. 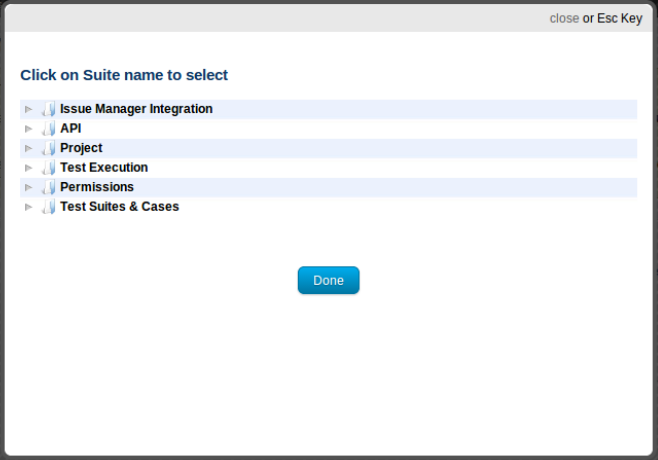 The option is available under Import menu on Test Suites & Cases tab. If an authorized user opts to import the test suites from other project(s), then a form like this will be shown. If there are other projects that have test suites created/copied under them, then their list will be on under project's drop down. When a project is selected then typing in the suites' selector box shows up the names of suites that match the criteria entered. As an option one can click on the "Select from tree" icon, this will show up the suites' list to select suites from the tree shown. Linking a test suite will only 'link' the original test suite user has created without creating any copy of it. This feature is useful when user wants to share some common tests between his projects. However, the linked suite can be moved and made a child of other existing not-linked suite. There is also an option to Unlink the linked suite. Copy function, is used to duplicate all child suites and test cases under selected test suites from the source project to the destination project. This is recommended when there is some level of similarity in projects but user intents to alter a test suite differently for destination project. Copying means any change in suite or cases made in this (target) project will have no effect onto the project (source) from which it was copied and vice verse.